Welcome to Spain, a country filled with Moorish palaces, Gothic cathedrals, Roman Aqueducts, modern artwork, delicious food and wine, fertile planes, crystal clear seas and soaring mountains. Upon arrival at the Barcelona airport, a representative will be waiting to transfer you and your spouse to your luxury hotel. Enjoy the afternoon with each other as you explore the unique blend of traditional and modern architecture or discovering the delicious local cuisine. Ask your travel consultant for recommendations of their favourite restaurants, cafes and bars to try while on your honeymoon. Discover the Quadrat d'or on your special private guided tour through the Eixample district. This exceptional area was once the focus of Barcelona's Modernism, Art Nouveau style, during the late 19th and early 20th centuries. Take a leisurely stroll through this beautiful neighbourhood, admiring the Catalan Modernism style buildings by architects, such as Antonio Gaudi, Domenech i Montaner, and Puig i Cadafalch. The highlights of the tour include visits to the Martí, the Palacio de la Musica, Gaudi's world famous Sagrada Familia, and to modernism houses including the Casa Batllo, La Pedrera, Casa Lleo i Morera, and Casa Terrades. 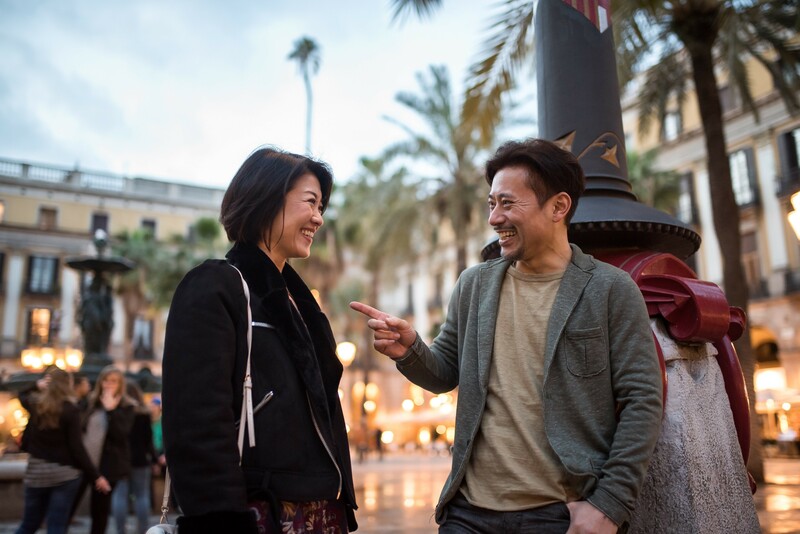 Relax with your partner by soaking up the rich culture of Barcelona's vibrant streets or taste the local flavours on a Gourmet Tapas Discover tour. Visit the city's best landmarks such as the Gothic Quarter and Picasso Museum. Ask your leisure consultant for ideas filled with their favorite sites and activities in the city, so you can both have an amazing experience together. After breakfast, you will be transferred to the train station and take a high-speed train to Madrid. Upon arrival, a representative will be waiting to transfer you both to your romantic hotel. Enjoy the remainder of your day at leisure. Marvel through the rich history of Madrid, during your private walking tour of the city's historic centre and the Royal Palace. Your licensed English-speaking guide will meet you both at your hotel, before setting off through the historic streets, discovering the old quarter, the Barrio de la Moreria, and learning about the city's Moorish roots. Continue to the Renaissance and Baroque buildings of the Habsburg era, in Calle Mayor, the Plaza Mayor, and the Plaza de la Villa. At the end of your wistful walking tour through the old quarter, make sure to visit the impressive Royal Palace, the former residence of the Spanish Kings. The palace is adorned with the royal family's exquisite collection of tapestries, porcelain, antique clocks, armour and artworks. Admire priceless paintings by Goya and Velazquez, as well as the official Reception Hall, the Royal Chapel, Hall of the Throne, and the private room of King Carlos III and Queen Isabel II. Enjoy a leisure day, as a newlywed couple, by exploring the city's exceptional museums and spectacular architecture or take a day trip to Toledo, known as the city of three cultures, where Christians, Jews and Arabs lived together in harmony for centuries. Ask your travel consultant for recommendations on the best places to visit, with your loved one by your side. After breakfast, you will be transferred to the Madrid airport, to catch a flight to Lisbon. Your private driver will be waiting to take you to your luxury hotel. Enjoy the remaining day with your husband or wife, as you soak up the beautiful architecture and unique atmosphere of this seaside city. Start your day by discovering the must-see monuments of Lisbon together with your private guide and loved one by your side. Begin in the historic Belem neighborhood, the same place many great Portuguese explorers embarked on their voyages of discovery, such as Prince Henry the Navigator, the first overseas expedition to conquer Ceuta in Morocco, Bartholomeu Dias to round the Cape of Good Hope, the first voyages of Ferdinand Magellan, and Vasco da Gama's discovery of the sea route to India. Visit the Belem Tower, originally built in 1515 as a fortress to guard the entrance to Lisbon's harbor, or the Discovery Monument, built in honor of Henry the Navigator, who led Portugal's discovery expeditions into the New World, during the country's heyday in the 15th century. Continue your exploration to Jeronimo's Monastery, the most impressive symbol of Portugal's power and wealth during the Age of Discovery, built by King Manuel I in 1502, to commemorate Vasco da Gama's voyage and to thank the Virgin Mary for its success. Following along the river bank, towards the Commerce Square, you will pass through the Alfama neighbourhood, highlighting the city's Moorish legacy, before heading to the Pombalina district, a UNESCO World Heritage Site. See the lively Rossio Square, Liberty Avenue and the Marques of Pombal roundabout as you romance each other in Portugal. Use your free time to indulge in the rich culture and delicious food of Portugal's capital city or take a day trip to Sintra, one of most beautiful regions in the country. Explore your love for one another on the last day of your honeymoon at this magnificent medieval village, housing a 14th century Royal Palace, as you enjoy the quaint atmosphere and souvenir shops. Ask your travel consultant for more recommendations to discover, during your Portuguese adventure.